You picked a template and started working on it, now we need to make sure that we save it often! Let's learn how. 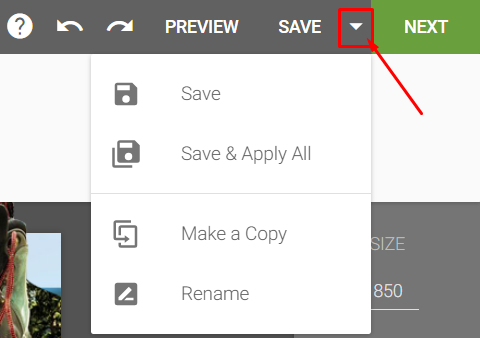 A quick note before we begin: It's best practice not to use the "Autosave" template, this is is used as a backup template for the changes you make and will auto-save by itself every 15 minutes. Whilst working on a template, you can click on SAVE at the top right corner, or use the keyboard combination CTRL + S.
2a. In case it's a new template -- a pop up will show up asking you to name the template, give it a nice name and hit Enter or click on Save to save the template under your My Templates page, it will show up with the name you gave. 2b. In case it's already a saved template, you will receive a green confirmation at the top right that the save was successful! Save & Apply All what it does is saves the changes you made and applies them on all of the listings that use this template! This is a very powerful tool to bulk update your listing's design with just a few clicks. Make a Copy will create an exact copy of the template and will open it for you in a new tab, this will act as a new template. Last but not least, Rename will, well.. rename your template!